^ Tommasini, Anthony. "Beverly Sills, All-American Diva With Brooklyn Roots, Is Dead at 78", The New York Times, July 4, 2007. Retrieved November 6, 2007. ^ "The Love for Three Oranges: A Slaphappy Fairy Tale Makes a Smash-Hit Opera", Life Magazine, November 1949. ^  Archived March 31, 2009, at the Wayback Machine. ^  Archived October 19, 2013, at the Wayback Machine. 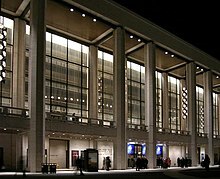 ^ Philip Boroff (June 1, 2009): "New York City Opera Ran Up $11 Million Deficit as Sales Dropped", Bloomberg L.P.. Retrieved on June 6, 2009. ^  Archived March 5, 2012, at the Wayback Machine. ^  Archived March 19, 2014, at the Wayback Machine. New York City Opera Sings Stories and Productions of the New York City Opera, 1944-79. (1981). ISBN 978-0-8239-0544-7. Martin L. Sokol (1981). The New York City Opera an American adventure. MacMillan Publishing Company. ISBN 0-02-612280-4. Southern, Eileen (1997). The Music of Black Americans A History. W. W. Norton. ISBN 978-0-393-97141-5.